Mahatma Gandhi Speech - August 8, 1942, A.I.C.C. Mahatma Gandhi's address given in Mumbai is one of the best speeches. Let's know his speech - and see what he gets from him. Before starting a discussion on the proposal, I would like to have one or two things in front of everyone, I want to understand two things clearly and I consider those two statements important to all of us. I want all of you to see those two words from my point of view, because if you adopt those two words, then you will always remain blissful. This is a great responsibility. Some people ask me if I am the person I used to be in 1920, and whether there is any change in me. You are absolutely right to ask that a question. I will assure you that soon I am Mohandas Gandhi as I was in 1920. I have not changed my self esteem. Even today, I hate non-violence as much as I did at that time. Rather my force is also growing rapidly. There is no contradiction in my current proposal and earlier articles and nature. Current opportunities do not come in everyone's life but sometimes it comes in one's life. I want all of you to know that there is nothing more pure than non-violence, I am saying this thing today and I have been walking on the path of non-violence. The proposal made by our executive committee is based on non-violence, and all the elements of our movement will also be based on non-violence. If any of you do not believe in non-violence then please do not vote for this proposal. I want to tell you clearly about today. God has given me a valuable weapon in the form of non-violence. 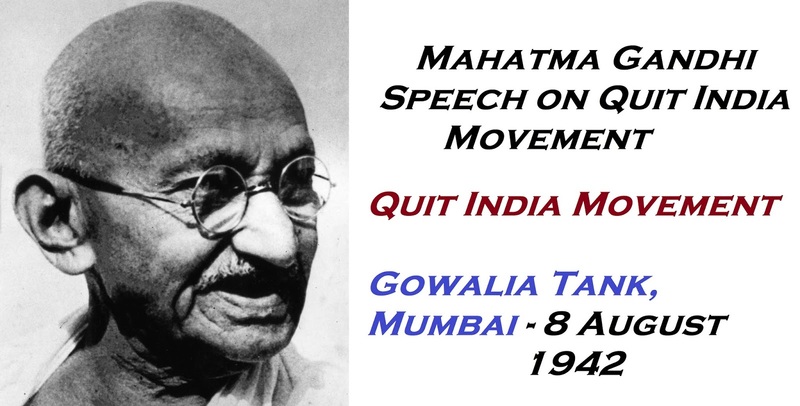 I and my non-violence are our way today. In the present time where the earth has sunk in the fire of violence and the same people are crying for salvation, I have also failed to use the knowledge given by God, God will never forgive me and I will not forgive him. Gift was not understood quickly. But now I will have to follow the path of non-violence. Now instead of scared I will have to move forward. Our journey is not only for getting strength, but for nonviolent war for India's independence. There is a high degree of dictatorship in violent travel, whereas non-violence has no place for dictatorship. An non-violent soldier does not have any greed for himself, he only fights for the country's independence. Congress is anxious about who will rule after independence. Whatever strength comes after independence, the people of India will be concerned and the people of India will decide who is to give them these countries. It is possible that the people of India can give their country to the hands of Paris The Congress wants to unite all the communities, not that they want to divide them by dividing them. After independence, the people of India can choose to manage their country according to their wishes. After selecting and the people of India will also have to follow suit accordingly. I know that non-violence is not perfect and I also know that we are far away from the views of our non-violence but in the absence of non-violence, the last failure is not. I have full faith that only big things can be accomplished by doing small things. All this happens because seeing our struggles, God eventually becomes ready to help us. I have the confidence that in the history of the world more than us and any country has struggled to get democratic freedom. When I was in Paris, I had read the French French proposal and Pandit Jawaharlal Nehru also told me a lot about the Russian proposal. But I have full faith in the fact that when violence will be fought for freedom, then people will fail to understand the importance of democracy. The democracy that I have thought of will be created with nonviolence, where everyone will have equal freedom and authority. Where everyone will be their own teacher. And today I have come here to invite you to build this democracy. Once you understand this, then you will forget the discrimination of Hindu and Muslim. Then you will consider yourself as an Indian and will fight in the struggle of independence. Now the question is about your attitude towards the British. I have seen that some people have a hatred towards the British. Some people say they have been irritated by the behavior of the British. Some people have forgotten the difference between British imperialism and British people. Both of them are identical for those people. Their hatred is inviting the Japanese. It will be quite dangerous. This means they will swap one slavery with another slavery. We should remove this feeling from our heart. Our fight is not with the British people but we have to fight with their imperialism. My proposal to end British rule is not complete with anger. It is not a happy matter for a big country like India that the British people are imposing money from us. Today, there is only one reason for their unhappiness, my deep friendships. From my point of view, he is currently sitting on the brink of hell. And it will be my duty that I challenge them for the danger of coming. At this time, where I am starting the biggest struggle of my life, I do not want anybody's hatred towards anyone.